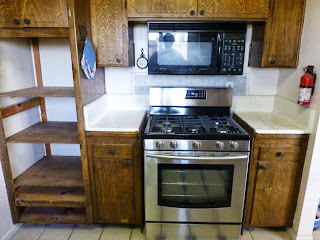 I removed my electric oven and gas cooktop, cut the cabinets and tile to accomodate a new gas free standing range, and reworked the cabinet space by adding some side panels and some shelves. Fortunately for me, this required minimal skills and tools I already own. 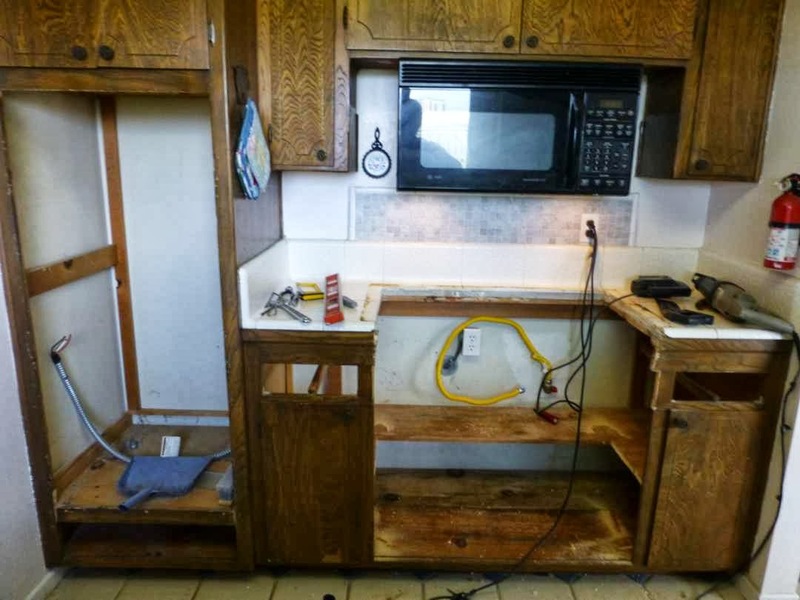 If you're thinking about changing out your old cooking appliances for a nice new range like I did, let me assure you that it's not very difficult. If I can do this anyone can. 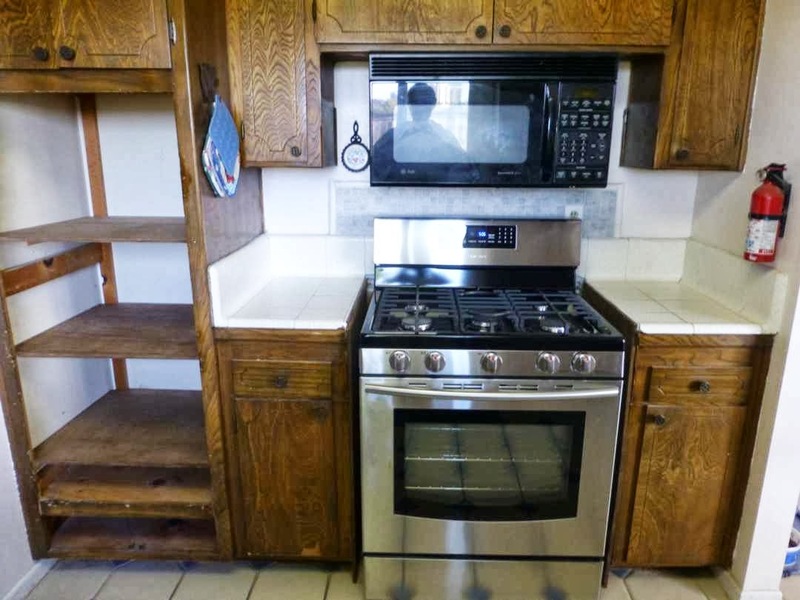 We'd love a new dream kitchen, but we're still trying to figure out how to pay for it. One day the oven started making noise like a jackhammer every time it was turned on, so we had to do something right away. This is only supposed to be temporary so I was trying to get off cheap. The new gas range only cost $1K (Best Buy, Labor Day) with free delivery and I spent less than $100 on the rest. Hey! 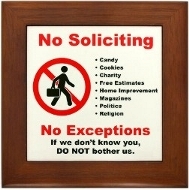 Now we can put off that expensive kitchen remodel for a while longer, I hope. This is what I started with. 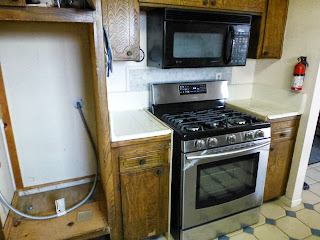 Electric double oven and gas cooktop in a kitchen that badly needs remodeling. I talked the delivery guys for the new range into taking the old duel electric oven with them, in part by having it ready to go. I removed the side rails and unscrewed it from the cabinet. I then pulled the circuit breaker and disconnected the power from the oven. All they had to do was pull it out and carry it off, which they seemed happy to do even though that wasn't part of the deal. I removed the cooktop and then the tile from around the opening. I cut into the cabinets using both a reciprocating saw and a jig saw. I used a heavy duty angle grinder with a masonry wheel to tidy up the jagged tile, especially around the curved area in the back where I had to first chip out the curved section with a chisel and then clean it up with the grinder. If you don't have the power tools (reciprocating saw, jig saw, angle grinder with a masonry wheel) you can buy low-budget versions of all three at Harbor Freight Tools for around $100. You need both gas and electric service to run a gas range. I was lucky enough to have a gas line already installed in the right place but in order to get the range as close to the back wall as possible I did have to relocate the wall socket. This particular model range has spaces in the back that are large enough to accomodate things like gas lines and surface mounted wall sockets, if you have them in the right place. If necessary, moving an electrical socket is easy enough, but if you don't have a gas outlet in the right place you should hire a professional to install a gas line. 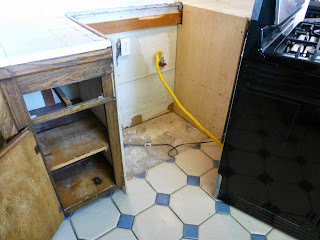 I needed plywood to close off the sides of the cut cabinets and to add shelves to the space left by the oven. Since I can't transport full-size plywood panels, much less trust myself to cut a straight line on one, I bought pre-cut plywood at Home Depot in much smaller pieces where one dimension was correct. They will make one free cut to each piece of wood you buy so I had the clerk in that area cut the plywood for me to get the other side dimension right...and straight. I made cuts on two corners with a jig saw to fit them in place. After attaching the side panels to the cabinets with drywall screws I used more screws to attach the shelves to the side panels. Check the rough-in on the range then remove the metal-clad power line for the old oven. Power to this particular line is still turned off at the circuit breaker. Finally, stain all new wood and install shelves in the opening left by the electric oven. Silicone caulk was used to fill in the joints between the tile and the plywood around the new range. 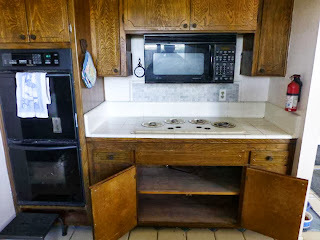 The salvaged cabinets are still old and dingy, but they're functional and the new Samsung FX510BGS range is excellent.